Whatever else you might think of it, the billboard advertising Ford’s Ka, seen on the streets of London this summer, is an unusually barefaced statement of the issues involved. Under the copy line ‘London’s Alternative Transport’, the outline of the Ka emerges from a multi-coloured network of tyre marks rendered in the immediately recognisable shape of Henry Beck’s famous London Underground map. Forget public transport, says the ad – it will only let you down. Wise up, abandon the declining infrastructure, jump into the cutely proportioned Ka and drive into London … to join the other private car drivers in the capital’s increasingly clogged and slow-moving centre. A few days after I first came across this shamelessly misleading ad, in a street near where I live, some unknown member of the public answered back. Slapped across the chassis of the Ka, small but unmissable, in neat, black line-work, was a poster bearing the hand-drawn words ‘Let London breathe’ and the image of a woman’s bicycle. This changes everything. Suddenly the Ka billboard ceases to be a monologue, a piece of highly resourced and one-sided propaganda for a commercial point of view, and becomes a dialogue in which a radically different perspective is shown to exist. From this other viewpoint, the ‘alternative’ isn’t more cars on London’s streets, it is fewer cars, and other ways of solving the transport problem. Anyone looking at the Ka billboard now would have to think about the meaning of its claim to offer an alternative to public transport, even if they then went on to dismiss the cyclist / clean air point of view. The poster-sticker’s modest intervention and the unexpected rupture of the ad’s slick surface also serve to expose the reality of contemporary advertising. Billboards might occupy narrow shards of private space – leased from the poster-site owner – but they project their messages across collective airspace into notionally ‘public’ streets. You would have to keep your eyes fixed on the ground, or the dashboard of your Ka, not to see them. Street ads are a privileged form of address and the space they commandeer is disproportionate. Only the rare sight of a mural comes anywhere near to equalling the scale, intensity and impact of this public imagery. Advertising’s right to colonise the physical environment of the street and act as primary shaper of the mental environment is taken for granted and there is no officially sanctioned public competition for the thoughts, beliefs, imagination and desires of the passer-by. Apart from other ads. ‘Let London breathe’ is a small but telling reminder of all that is routinely excluded and denied expression in our supposedly public highways, but it is also significant in another way: it is a piece of graphic design. Not professional design; sophisticated metropolitan imagineers would probably sneer at the folksiness of the lettering and the antique air of the bike. 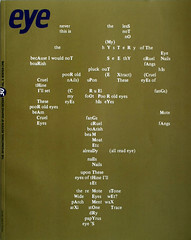 The poster is awkwardly trimmed around the word ‘Let’, which projects beyond the main image area, suggesting it might have been cut from a larger image; perhaps it was made for some previous protest or action. Yet despite these oddities (partly because of them) it has graphic force. It has been designed for a use – and applied; it reads well and you can’t miss it. If an amateur activist with a felt-tip pen, a pot of paste and the most rudimentary graphic skills can make you pause, what might a more professionally conceived form of graphic activism accomplish? Pointed they may be, but these are interventions by artists using the tools and techniques of graphic design, not by graphic designers. Professionals, if they consider the issues at all, seem uncertain how to proceed. One of the most thoughtful recent discussions of the subject, by British design educator Russell Bestley in the journal Zed, works painstakingly towards the tentative and far from galvanic conclusion, in his final sentence, that ‘the possibility of intervention still remains’. Has it ever been in doubt? The same sense of being forever poised at the door, but never quite ready to leave the building, has characterised the activities of the Jan van Eyck Akademie in Maastricht, where the director, Jan van Toorn, a 1970s Dutch graphic activist of considerable renown, promised to integrate fine art, graphic design and cultural theory in a new critical synthesis. At Van Toorn’s ‘Design Beyond Design’ conference, dedicated to the role of the critical practitioner, design theorist Gui Bonsiepe suggested once again (in absentia) that, ‘The designer acting as designer, that is, within the framework of his profession and with the tools of his profession, faces the particular challenge to translate his critical stance against the status quo into a design proposal.’ Well, yes. But what? How? None of the speakers had much to say about that and some of the younger designers present, charged to go forth and intervene, were not convinced. Cynicism is an excuse for doing nothing, a self-fulfilling prophesy. Rejecting this too easy get-out, Credland’s Debate poster series, undertaken in his final year at the academy, and mailed to 150 activists, designers, artists and educators, is a call for discussion with a view to developing a contemporary strategy for the inclusion of politics in visual communication. As areas of concern, Credland highlights three issues: recuperation, the process by which radical gestures are incorporated, neutralised and sold back to the audience as commodities by the dominant forces of capitalism (as happened with the style-fixated ‘new typography’ of the 1990s and the use of bad taste and shock – once central strategies of the artistic avant-garde – in recent ad campaigns). Whether exposing the mass media’s processes of commodification can lead to greater democracy; and the daunting, recurrent question, by which the enterprise thrives or fails, of whether, and how, it is possible to find ways to intervene graphically into corporate culture to contest its global dominance. Credland concedes that the responses published by Debate declined to move very far beyond the established territory of professional discourse. Yet, as he knows, outside the profession, in cultural theory and media activism, these issues are being addressed. If graphic design is failing to generate its own theories and strategies of resistance, it becomes all the more necessary to look elsewhere. The first thing to observe is that the climate of intellectual opinion is changing, and the popular mood may follow. The deep cynicism and political inertia among designers in their twenties and early thirties, inflicted, at least in part, by growing up during the 1980s and early 1990s under long periods of right-wing power, may prove to have been a temporary pall. In Britain, the arrival of a Labour Government in May 1997, though it is by no means conventionally socialist in its political programme, reintroduced the idea that governments could change and other points of view be heard. Emboldened, traditional socialism, though still marginalised, began to reassert its voice. Daring to discuss what had so recently been regarded as beyond the pale, the New Yorker, no less, ran an essay reassessing the economic thinking of Karl Marx (later published in Britain). To commemorate its first printing, 150 years ago, Marx and Engels’ Manifesto of the Communist Party, was reissued. Other reappraisals of Marx appeared in newspapers, cultural magazines and on television. In the 1990s, media activists whose concerns rarely come to the attention of international news magazines and lifestyle-obsessed Sunday papers are sharpening the tools of contemporary dissent. The ideas they advance, the methods they use, the goals they set out, and the alliances they form are much as Neil Ascherson describes (he is either remarkably prescient, or knows more than he lets on). They occupy an unfamiliar political position that is neither left nor right, as we once understood these ideologies. In North America, where some of the more visible activists work, their project has acquired a generic name, ‘culture jamming’, a term coined in 1984 by the American experimental music and art collective, Negativland, to describe billboard liberation and other forms of media banditry: ‘As awareness of how the media environment we occupy affects and directs our inner life grows, some resist … The studio for the cultural jammer is the world at large.’ Cultural critic Mark Dery’s Culture Jamming (1993) was the first publication to answer the question ‘what shape does an engaged politics assume in an empire of signs?’ by codifying such non-graphic tactics as media hoaxing and audio agitprop, as well as the more familiar techniques of billboard refacing; it remains one of the movement’s essential texts. ‘We will culture jam the pop culture marketeers – MTV, Time Warner, Sony – and bring their image factories to a sudden, shuddering halt. Adbusters has drawn criticism for the slickness – and seeming contradiction – of its self-marketing, but this has helped to build its profile as a campaigning organisation bold enough to take on the most powerful players in the communications conglomerate, and the foundation has scored some notable hits. Lasn’s modus operandi is to fight fire with fire. Now in his early fifties, soft-spoken, articulate and absolutely convinced of the rightness of his cause, he accepts the forms of existing media – ‘There’s nothing wrong with the medium. I think what’s wrong is the people who are controlling the medium right now’ – but demands the democratic freedom to express opposing points of view. The Media Foundation is engaged in continuous and costly battles with North American TV stations to insinuate the provocative ‘uncommercials’ made by its Powershift agency, such as ‘Obsession Fetish’ (‘Why are 9 out of 10 women dissatisfied with some aspect of their bodies?’) and ‘The Product is You’ (‘Cast off the chains of market structured consciousness!’), into the commercial breaks. Spoof print ads – ‘subvertisements’ – relentlessly needle the likes of Calvin Klein (‘Calvin Klones’), Gucci (‘Pucci – tight collars, short leashes’), and Camel cigarettes (Adbusters’ chain-smoking ‘Joe Chemo’ looks perpetually at death’s door). To encourage others to carry on the fight, the ‘Culture Jammer’s Toolbox’ on Adbusters’ website offers practical advice on jamming a focus group, buying TV airtime and creating a print ad. From the outset, says Lasn, designers, photographers and others in the creative professions, sometimes from within advertising itself, volunteered their anonymous services. As a result, uncommercials that would otherwise cost $100,000 can be made to the highest standards – essential if they are to compete with advertising – for $3000. ‘I realised that there is a huge percentage of graphic artists within the advertising industry who are profoundly unhappy with their industry’s ethical neutrality,’ says Lasn. ‘Given the chance they would dearly love to be using their skills for other purposes, and these people finished up being very powerful allies for us.’ At the American Institute of Graphic Arts’ ‘Brandesign’ conference in October, he planned to ask designers to ‘jump ship’ and join the culture jammers in launching a ‘revolution of the information age’. Lasn and the recently redesigned Adbusters magazine exemplify the public face of corporate resistance in the 1990s, and run the very real risk of recuperation (witness a recent British commercial for the Vauxhall Vectra in which environmentalism is lampooned – ‘Get a job,’ the smug driver tells the ‘loser’ tree protester). But some of the closest analysis and most suggestive speculation about contemporary conditions is coming from theorists who propose small, mobile, anonymous units – Ascherson’s ‘inchoate, unstructured groups’ – as a vital operational principle. One of the most influential ideas in these circles is Hakim Bey’s concept of the temporary autonomous zone (TAZ). In a long, lyrical essay, Bey deliberately refrains from defining his idea, preferring to encircle it with flashes of poetic illumination. ‘If the phrase became current’, he writes, ‘it would be understood without difficulty … understood in action [my italics].’ The TAZ, a space, a place, a hide-out, a platform, a launchpad, may be short in duration; it will certainly be finite in life. For as long as it lasts, its occupants have complete freedom to plan, to act and to proceed as they like. The TAZ, by its nature, exists within a larger body – an organisation, a company, the State – and while it remains unnoticed it can contravene the aims, rules, conventions and expectations of its host. When it is discovered, or conditions otherwise change in a way that prevents it functioning with its previous autonomy, it simply dissolves. Its builders may be able to find suitable conditions to reconstitute the TAZ elsewhere, like nomads who wander from one campsite to the next, or they may regroup and make new alliances to form other kinds of TAZ. The temporary autonomous zone makes no claims to be a revolution. It is an impermanent uprising, a liberatory ‘power surge’, in Bey’s words, which in no way rules out other forms of organisation. Can a TAZ exist within the structures and activities of graphic design? Potentially, a TAZ could exist anywhere. Do any such zones exist? By definition, that’s a question that can probably only be answered retrospectively. The TAZ, as Bey explains, is in some sense a ‘tactic of disappearance’. Elsewhere, looking back at Tibor Kalman’s editorship of Colors – to which Benetton played corporate host – I have argued that it was a form of TAZ, in which, for a short time, he was able to realise his own ideological project. But clearly, although he wound up his design firm, and thereby staged a personal and professional ‘disappearance’ (in this rather specialised sense), he remained highly visible, as one of graphic design’s celebrities. If his career path and renunciation of commercial design do offer a model, it is one to which only the most successful designers can aspire. The unwelcome news, for graphic designers hooked on the idea, glamour and goal of celebrity, is that anonymity gives the greatest freedom of manoeuvre when it comes to genuine acts of resistance. In their book Electronic Civil Disobedience, the American artists and activists Critical Art Ensemble develops an analysis of the ways in which power and capital have become nomadic, rendering previous leftist conceptions of insurrection redundant. There is no ‘centre’ of power anymore, no citadel to storm and take; the battle cannot be fought in the streets, CAE argues, because ‘as far as power is concerned, the streets are dead capital’. It follows that the only way to fight a decentralised power is by using decentralised, nomadic forms of resistance, as Hakim Bey suggests. Since power now inhabits cyberspace, CAE breaks with earlier, no longer productive models of activist thinking by proposing to move the resistance to cyberspace, too, where a new kind of activist will disrupt errant corporations and repressive communications in the way that Neil Ascherson predicts. To this end, CAE conjectures a somewhat unlikely sounding alliance of directionless computer hackers, who have the digital know-how, and activists, who have the ideological purpose. If this sounds like a nihilists’ charter for the end of civilisation as we know it, it should be stressed that this is not CAE’s intention. Like Hakim Bey, they believe that ‘revolution is not a viable option’ and that ‘authoritarian structure cannot be smashed; it can only be resisted’. If we value true democracy this resistance must continue, but it has to take into account the conditions of contemporary power; only then might it be able turn the Spectacle against itself. These ideas are, in any case, at such an early stage of development, as CAE acknowledges, that the role of the designer has yet to be defined (CAE does, however, advance a trenchant critique of art). In Electronic Civil Disobedience, they propose the formation of secret cells of four to ten people, bound together by trust, mutual interdependence, a shared political perspective, and a range of skills – activist, theorist, artist, hacker, lawyer. If CAE leaves design out of the list, even though it’s possible to imagine occasions when it could play a central role in digital assaults on power’s symbolic order, perhaps it’s another sign of graphic design’s own slowness to develop new possibilities for graphic resistance in the digital era. Think of them now: a hundred – a thousand – unknown dissidents of the electronic age, poetic terrorists seeding the system with the uncontainable flowers of a new democracy and freedom. They don’t want you to know who they are. They do just want you to feel the tremors of their disturbance. And, in the coming years, we shall. Mark Achbar, Manufacturing Consent: Noam Chomsky and the Media, Montreal, New York and London: Black Rose Books, 1994. Neal Ascherson, ‘We live under the most arrogant of all world orders, but it will not last’, Independent on Sunday, 25 January 1998. Russell Bestley, ‘Design, intervention and the Situationist approach’, Zed no. 3, 1996. Hakim Bey, T.A.Z. The Temporary Autonomous Zone, Ontological Anarchy, Poetic Terrorism, Brooklyn: Autonomedia, 1991. ––––, Immediatism, Edinburgh and San Francisco: ak Press, 1994. Gareth Branwyn, Jamming the Media: A Citizen’s Guide, San Francisco: Chronicle Books, 1997. David Campany and Gavin Jack, ‘AVI’, Transcript vol. 3 no. 1, undated. Critical Art Ensemble, The Electronic Disturbance, Brooklyn: Autonomedia, 1994. ––––, Electronic Civil Disobedience, Brooklyn: Autonomedia, 1996. Mark Dery, Culture Jamming: Hacking, Slashing, and Sniping in the Empire of Signs, Westfield, NJ: Open Magazine Pamphlet Series, 1993. Umberto Eco, ‘Towards a semiological guerrilla warfare’, in Travels in Hyperreality, London: Picador / New York: Harcourt Brace Jovanovich, 1986. Peter Hall (ed. ), Tibor, Booth-Clibborn Editions, 1998. Karrie Jacobs and Steven Heller, Protest Posters of the Reagan/Bush Era, Salt Lake City: Peregrine Smith Books, 1992. Liz McQuiston, Graphic Agitation, London: Phaidon Press, 1993. John Miller, ‘Billboards: dominant visual modality of the New American Landscape’, in John Miller, Egotopia: Narcissism and the New American Landscape, Tuscaloosa: University of Alabama Press, 1997.